Foodies will love Kuramathi: there’s a huge choice for all palates and even on a two-week honeymoon in the sun you can try a different restaurant or dining experience every night and not eat the same thing twice. For starters there are three main buffet restaurants, not to mention the speciality dining, including Thai and tandoori, Teppanyaki and Italian. Book one of the upgraded villas with dining spaces and you can even enjoy in-villa dining on your own deck. The resort is one of the most popular in the Maldives, ideal if you’re looking for a bit of variety as well as the relaxing Maldivian break. There are two oceanfront infinity pools plus a shaded pool shaped like a lagoon – the island even has its own house reef and snorkelling is possible directly from the beautiful beach. If you’re feeling adventurous you could don your snorkel or diving apparatus and check out one of the 20 local dive sites (there’s a huge variety of marine life, including hammerhead sharks and manta rays) or book a sunset cruise on a traditional dhoni – the ultimate romantic experience that will elevate your honeymoon to heavenly. The accommodation ranges from simple and tranquil Garden and Beach Villas dotted around the resort to the new Sunset Pool Villas that sit on the edge of the sands, partly over the water. 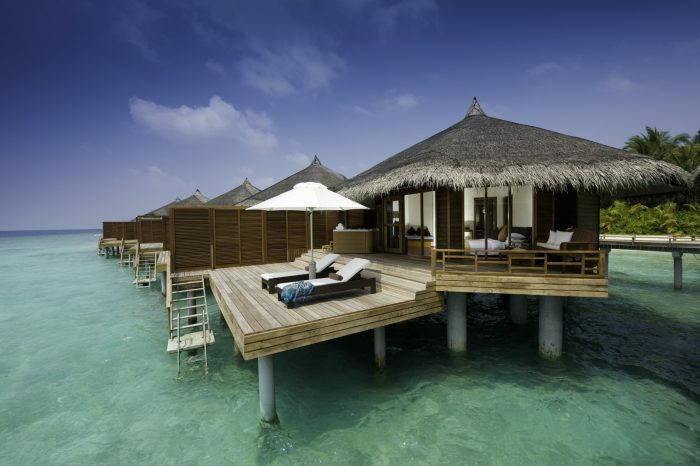 Your honeymoon at Kurthamathi Island Resort, Maldives could be the stuff that dreams of which dreams are made. Kuramathi is located on a large island, so there are plenty of space to explore, quiet areas to seek out and many restaurants to try. If you’re looking for a Maldivian escape but worried there won’t be enough to keep you occupied then Kuramathi might be the ideal choice for you. The island itself is enormous, very large by Maldivian standards, which means more space for activities. The spa is a real highlight, and with couples’ treatment rooms over the water you can your new beau can enjoy massages and wraps together, so you don’t need to spend a moment apart if you don’t want to. With a view of the reef sharks and baby manta rays below, it’s sheer bliss.